In the quest to develop higher-capacity, longer-lasting batteries, the focus is typically on materials or fabrication techniques. While developing a new way to study and observe battery performance in realtime, a team of researchers from the University of Maryland also discovered that by altering how their battery was charged, they could increase its capacity. The results are reported in the November 25 online issue of Advanced Energy Materials. 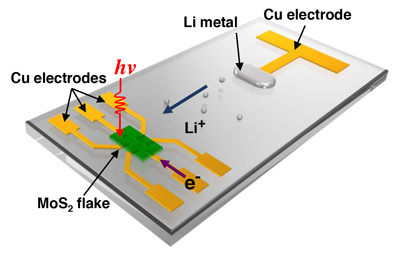 Together with collaborators at Monash University, Department of Materials Science and Engineering (MSE) professor Liangbing Hu and his research group at the University of Maryland Energy Research Center are the first to measure the optical and electrical transport properties of the individual nanoflakes that make up a battery’s electrode while it is being charged. Wan, Hu and their colleagues wouldn’t be able to do it with any battery off the shelf. The key to their technique was designing one that could be simultaneously observed and charged in a device called a probe station, which measures electric transport properties. They created a planar (flat) lithum-ion microbattery with electrodes made of two dimensional molybdenum disulfide (MoS2) crystals, a material currently being studied for use in photonic, optoelectronic and energy devices. Schematic of the MoS2-Li microbattery. Wan and research associate Wenzhong Bao (MSE/Physics) were testing the resistance of the new battery’s electrodes at the nanoflake level when they realized that the way in which it was charged could be as important as how it was made. For now, Wan says, the application of the charging technique is limited to Li-ion batteries made with MoS2, but the team is continuing its research, searching for other compatible battery configurations and electrodes. Bao, Hu and Wan’s collaborators include Professor Michael Fuhrer (Monash University, Australia); Hu Group members Jiaqi Dai, Fei Shen, Lihui Zhou, Daniel Urban, and Yuanyuan Li; Yang Liu and Katherine Jungjohann (Sandia National Laboratories); and Xinghan Cai (Department of Physics, University of Maryland).